The “2018 Taiwan Healthcare+ Expo” was held in Taipei for 4 days from November 29th to December 2nd. 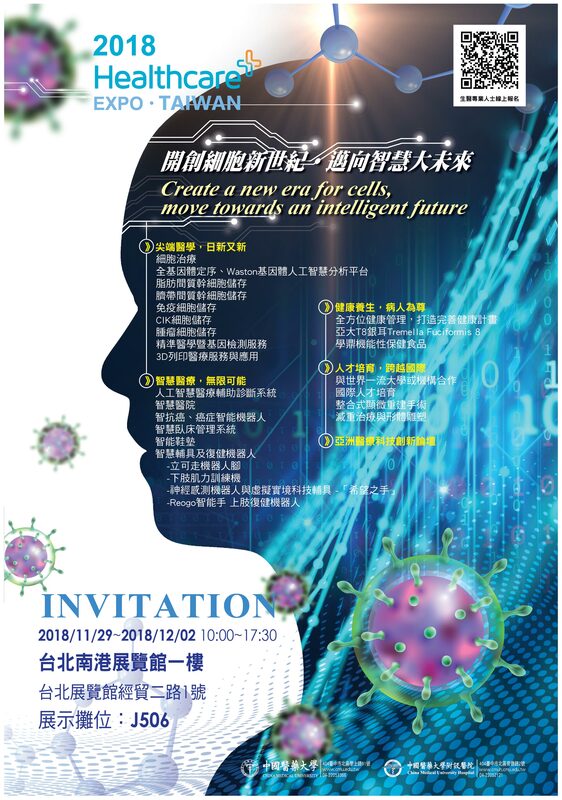 The exhibition theme of China Medical University Hospital (CMUH) was “Create a new era for cells, move towards an intelligent future”. 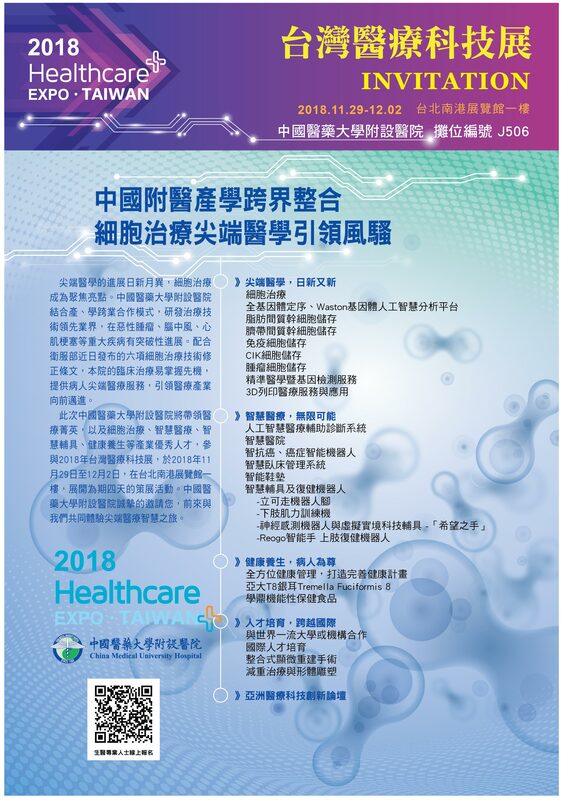 CMUH demonstrated the strength of Taiwan’s academic research, the development of cutting-edge healthcare, and the achievement of building smart ward and biomedical industry, with the aim to promote the healthcare industry and economic development, improve the welfare of patients, and create a better future. The expo is the first exhibition in the world that regards hospitals as the primary exhibition venders. The Institute for Biotechnology and Medical Industry (IBMI) has invited innovative technology teams and famous pharmaceutical companies from 15 countries, and 450 hospitals in Taiwan to participate in the expo. China Medical University (CMU) is the first university in Taiwan that integrates Chinese and western medicine. CMU pays great attention to both teaching and research, and trains its students to “engage in innovative research and pursue the excellence” to improve the quality of medical service in Taiwan. The university’s goal is to develop a research-oriented university that values teaching and service quality. Chancellor Wen-Hwa Lee emphasized that CMU has made a lot of efforts in research. It has established research centers for tumor, immunology, stem cell, Chinese herbal medicine, Chinese medicine and acupuncture, brain diseases, and aging. CMU has been actively recruiting outstanding doctors and research teams, and has been cooperating with prestigious medical centers and research institutions to develop advanced medical care. Under the leadership of Superintendent Der-Yang Chou, CMUH is developing a smart health and high-tech biomedical industry. CMUH has made breakthrough in many fields including glioma, stroke, myocardial infarction, etc. CMUH also provides advanced medical services for patients in clinical treatment. CMUH is constantly improving its healthcare and service qualities to provide the best services to the patients. The world is embracing the coming of artificial intelligence (AI). Therefore, CMUH actively establishes an AI Smart University & Hospital by developing AI, big data, 3D printing, minimally-invasive medical devices, smart assistive devices, new drug development, cutting-edge medicine, etc. At the same time, CMUH sets up spin-off companies which produces smart medical devices, recruit and cultivate AI talents with the aim to create an “AI Model Hospital” in Taiwan. The phase II clinical trial of dendritic cell immunotherapy led by Superintendent Chou has received the certification of FDA Orphan Drug Designation in USA, and is applying for TFDA pre-IND of Taiwan. This technology has been licensed to “Ever Supreme Biotechnology” for new cell drug development. The center cooperates with Ever-Health Bio Medical featuring in stem cell, immune cell and tumor cell storage, and launches with “precision medicine and genetic testing” that contribute to diseases prevention. It has developed latest cell technology for various mesenchymal stem cells, and CAR-T (Chimeric Antigen Receptor T Cells) for tumor, stroke, and degenerative diseases. On allogeneic mesenchymal stem cells, a phase I clinical trial has been approved by USA FDA and Taiwan TFDA. CMUH has developed and established AI-assisted diagnostic systems, such as breast ultrasound-assisted diagnostic systems, bone age assessment systems, and automated tumor selection for liver-assisted diagnostic systems, all of which benefit clinical diagnosis. CMUH has integrated multi-faceted medical statistics for big data analysis. Through the hospital information system, immediate warning can be sent for medical decision-making, which benefits final stage renal disease patients. In addition, information and communication technology (ICT) is integrated to provide smart medical care based on cloud services and mobile application. CMU and Asia University jointly established a health service website that integrated clinical database and major diseases research database to provide anti-cancer knowledge online counseling service. An intelligent robot “Dr. e” is created to provide the patients more than 1,000 pre-clinical and care instruction, just like a cancer encyclopedia. The center has combined the strengths of China Medical University/Asia University/Georgia Institute of Technology (CMU/AU/GIT) and external partners, created multidisciplinary project teams, integrated R&D, and developed innovative solutions. It also developed customize biomedical materials with new technologies, and transfer to Ever Supreme Bio Technology to introduce the materials into precision medicine such as dentistry, orthopedics, rehabilitation, orthopedics and neurosurgery. 8. CMUH has cooperated with PI Bioelectronics to develop “Brain-computer Interface neurorehabilitation devices” to promote patients rehabilitation; “Soft array pressure sensing devices” to make “wireless transmission shoe pad of pressure distribution detection” and “smart ward management system”, which has been adopted by many hospitals already. CMUH cooperates with HIWIN to develop smart assistive devices and rehabilitation robots. 10. Doctor Long-Bin Jeng, the expert of liver transplantation, developed a number of innovative transplant technologies; Doctor Hung-Chi Chen, the expert of reconstructive surgery, cured patients with critical diseases, cultivated physician team, and made contribution to the society.